Anything pertaining to the science of hearing that includes the treatment and rehabilitation of persons with impaired hearing. An important skill that is needed to do a job. 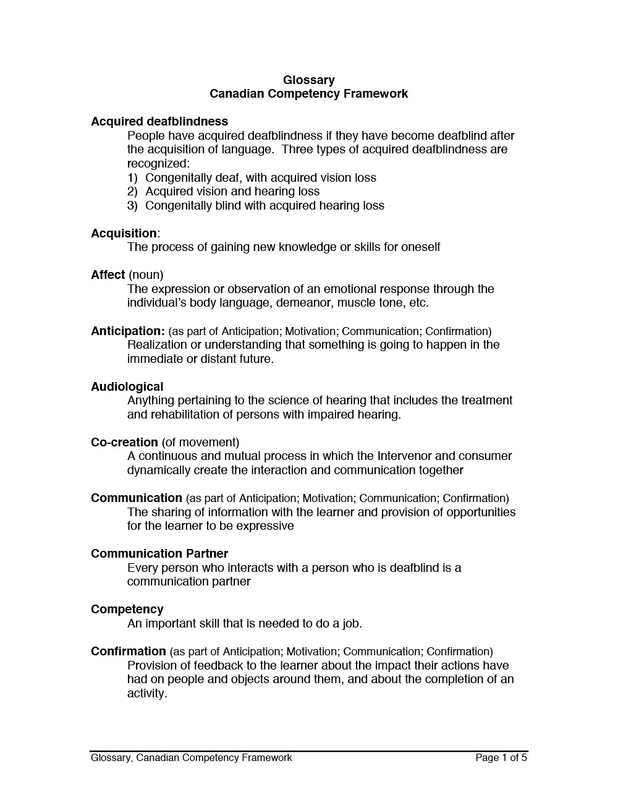 A person is congenitally deafblind if they have become deafblind before the acquisition of language. Deafblindness is defined as a significant degree of hearing and vision loss, the combination of which affects communication and access to information. An intervenor is a person who provides intervention to an individual who is deafblind. An intervenor mediates between the person who is deafblind and his or her environment to enable him or her to communicate effectively with and receive no-distorted information from the world around them. An intervenor acts as the eyes and ears of the person with deafblindness. An interpreter provides a professional communication service to individuals who are deaf or hard of hearing. Professional interpreters are knowledgeable in the language and culture of both Deaf and hearing people and provide communication in both a sign language and spoken language. Characteristics and medical issues associated with a syndrome that may not be present at birth, but appear in the adolescent or adult years. Eg., later manifestations of rubella syndrome may include: diabetes, irritable bowel syndrome, thyroid problems, glaucoma, changes in the neurological system, changes in behaviour. Anything pertaining to the science of vision, that includes diagnosis and treatments of defects and diseases of the eye, including surgery or other types of treatment, including eyeglasses or other optical devices. A professionally trained service provider who treats physical dysfunction or injury by the use of therapeutic exercise and intervention, intended to restore or strengthen normal function or development. The ability to sense the position, location, orientation, and movement of the body and its parts. Any artificial part that is used to supplement a physical disability or condition. The process of receiving and understanding a message. The vision and hearing still functional for individuals with visual and auditory impairments. Individuals can learn to use these senses to gather as much information as possible on their own. sense of the world and respond appropriately. Semicircular canals in the ear and vestibular nerve, which carries information about balance.